Megan Wood wins No Stirrup November by completing 30 lessons without her stirrups! Congratulations to Mason Milo and Kelly Acres Anastasia Champion .75 Jumpers! They had a stellar week! Congratulations to Jessica Behar and Cafe's Deluxe 10th in the Horse & Hound Finals and Reserve Champion in the .95 jumpers! Lulavani 3rd in the $18,000 Hunter Derby!! Team Cavallo wins the "Selfie Challenge" and the Popcorn!! Nikoletto did some more winning today too! Lulavani pulled out a couple of blues and Reserve Champion in Performance Hunters! Another win for Mason Milo and Kelly Acres Anastasia! Nikoletto won both of his classes today! Mason Milo and Kelly Acres Anastasia had a great day! Bree Rexroat and Adarco finish 1st in the 1.05 jumpers and Reserve Champion in the division! Mason and Gianna Milo win Reserve Champion in the costume class! Mason Milo and Kelly Acres Anastasia pulled out a pair of deuces! Lulavani did hunters today and won the Performance and the $2,000 Doc Nissan Performance Classic! Scores of 87 and 88! 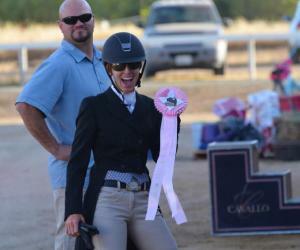 Sami Milo and Lulavani win the $7,500 NorCal Hunter Derby! 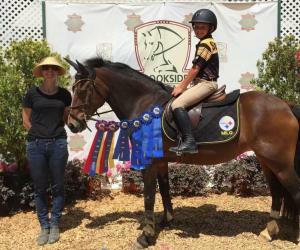 They topped a field of 53 riders with scores of 90 and 91 in round 1 and held the lead with round 2 scores of 90.5 and 94! Bree Rexroat and Adarco finished 5th in the Norcal Senior Medal Finals! Kayla Schaeffer also competed and finished just out of the ribbons. Megan Wood and No Regretcz finished 3rd in the Norcal Junior Medal Finals! Alex Behar also competed and finished just out of the ribbons. Alexis Behar and Cafe's Deluxe win the Hudson Medal! Even in this gross rainy weather! It was a great day for Bree Rexroat and Adarco! Kayla Schaeffer and Bet The Limit finished 8th in the Cloverleaf Finals! Kayla Schaeffer and Bet The Limit finish 7th in the Zone 10 Finals out of 35! Kayla Schaeffer and Bet The Limit win the A/A Hunters and 3rd Amateur Eq! Megan Wood and Arivederci Alex finished second in the SIHS Individual Championship! Finished 4th with Lulavani in tonight's $5,000 USHJA National Hunter Derby at Sac International! Jessica Behar and Cafe's Deluxe finish 2nd in the very competitive Jr/AO Hunter Classic! Megan Wood and Arivederci Alex finish 4th in the Jr/AOJumper Classic AND Reserve Champion USHJA Horse of the Year for 1.30 Jr/AO Jumpers! Megan Wood and No Regretcz end the show with a win in the NorCal Jr! Megan Wood and No Regretcz finished 5th in the Pickwick Finals! The ribbon is as big as me! Congratulations to Megan Wood and Arivederci Alex SHP Jr/Am Mod Circuit Reserve Champion! So proud of you Meg, this is a very competitive division! Lulavani won the first round of the USHJA International Derby. We had a woopsie in the second round and finished 7th. Megan Wood and Arivederci Alex win the Jr/Am Mods! Finished the week with a bang! Alexis Behar and Cafe's Deluxe win the ASPCA Maclay! 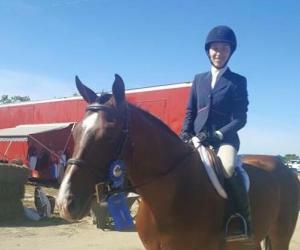 NorCal Eq Classic 15-17 Megan Wood 3rd overall and Alexis Behar 8th! Kayla Schaeffer and Ferradae finished up an awesome week with 7th overall in the NorCal Eq Classic 18-35. Megan Wood and No Regretcz win the Washington International after 2 phases. Congratulations to Megan Wood and No Regretcz. They won the CPHA Jr, Washington Itrl. Hunter Phase and 2nd in the Pessoa! She was also 3rd in the Jr/Am Mods on Arivederci Alex! Thrilled with our 5th place finish in the $5,000 Hunter Derby! Megan Wood and Arivederci Alex win the Children's Jumper Classic! Megan Wood and Arivederci Alex Reserve Champion Junior Modified Jumpers and 5th in the classic! Winner, Winner! Megan Wood and Arivederci Alex win the Junior Modified Jumpers! 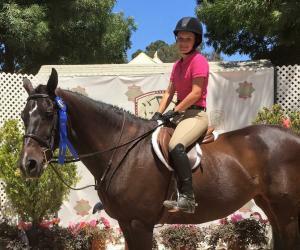 Congratulations to Megan Wood and Arivederci Alex Cavallo Stables Mini Prix Champion! Bree Rexroat and Adarco took Reserve Champion! After 4 very difficult rounds and switching horses TWICE, Megan Wood wins the 3'6 Cavallo Stables Medal Finals! Bree Rexroat finished second! Elizabeth Brew and Princess Ramira win the Cavallo Stables 3' Medal Finals!! Paige Downie was second! Congratulations to Dana Meyer and Devout for the win in the Cavallo Stables 2'6 Hunter Derby! Audrey Summers and Bourbon Street took second! Our 2' Hunter Derby Champions!! Jamie Campbell and Tye Dye for the win and Marylee Meyer and Cutie second! Congratulations to Bree Rexroat and Lulavani Champion Jr/Am Modified Classic! Sami Milo and Lulavani 2nd in the Mini Prix! 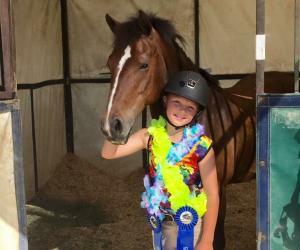 Mason Milo and Kelly Acres Anastasia were Pony Jumper Champion!! Well...she did it! Almost a clean sweep in the Low Amateurs, but definitely Champion! Congrats to Dana Meyer and Devout! Mason Milo's first victory gallop! He and Kelly Acres Anastasia took 7th in the 3 phase $500 Brookside Jumper Special! Dana Meyer and Devout had another awesome day! Givi Milo and Nikoletto cleaned up in the Short Stirrup today! 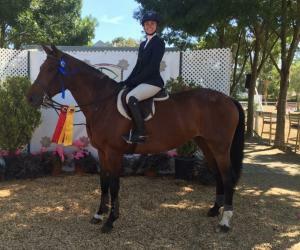 Congratulations to Maddie Roberts and Syddhartha 9th in the Almaden Special Eq! Congratulations to Dana Meyer and Devout on an amazing day! Won the Warm-Up 2'6 and Low Amateur Hunters and 3rd in SAHJA Mini Medal! Lulavani, owned by Cavallo Stables, won both Low Hunters and both Performance Hunters and was Champion in both divisions!! Mason Milo and Kelly Acres Anastasia won the Pony Jumpers and 3rd in .75! Devout, owned by Dana Meyers, won the 2'6 Warm Up, Pre-Green O/F and was Reserve Champion Pre-Green!! Congratulations to Jessica Behar and Cafe's Deluxe 5th and Katelyn Fox and Princess Ramira 10th in the SAHJA Ch/Adult Medal Finals. Bree Rexroat and Ferradae pull out some duces! Congratulations to Megan Wood and Arivederci Alex! Winners of the $1,500 Horse & Style Jr/Am Mod Classic! Hayley Johnson and Adarco finish 2nd in the Low Ch/AA Classic! Lulavani 3rd in the Derby at Sonoma! Givi Milo and Nikoletto Champion Short Stirrup! They won their Eq Over today! 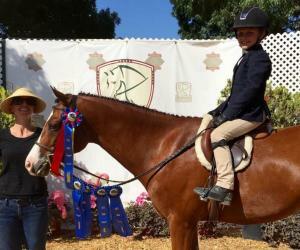 Mason Milo and Kelly Acres Anastasia Champion in Pony Jumpers AND .75! They won both of their classes again today! 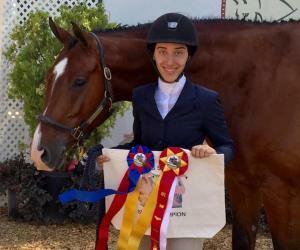 Alexis Behar and Cafe's Deluxe Champion Jr Hunters and Reserve Champion Modified Hunters! They were also 2nd in the NorCal 3'6!